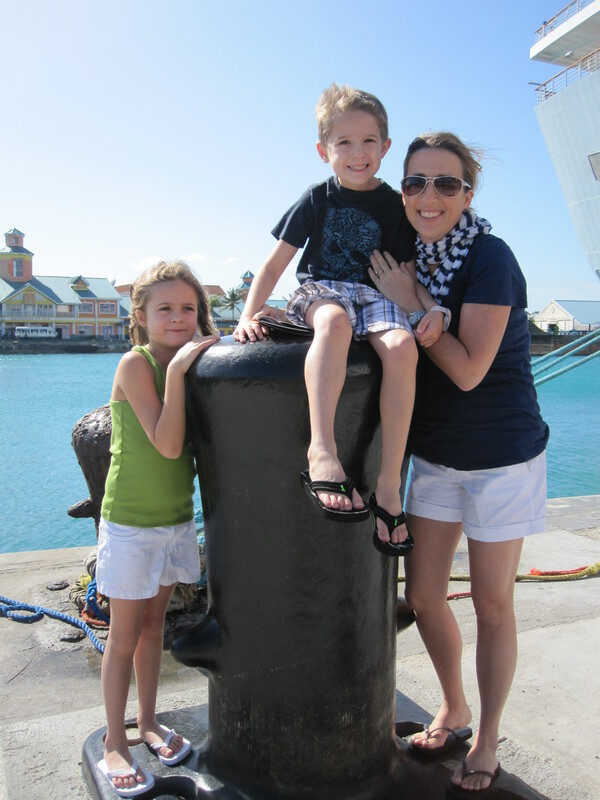 While we were on our vacation, we had a whole ton of people ask us about the cruise that we on. Enough questions in fact, that it warranted it's own write up here. 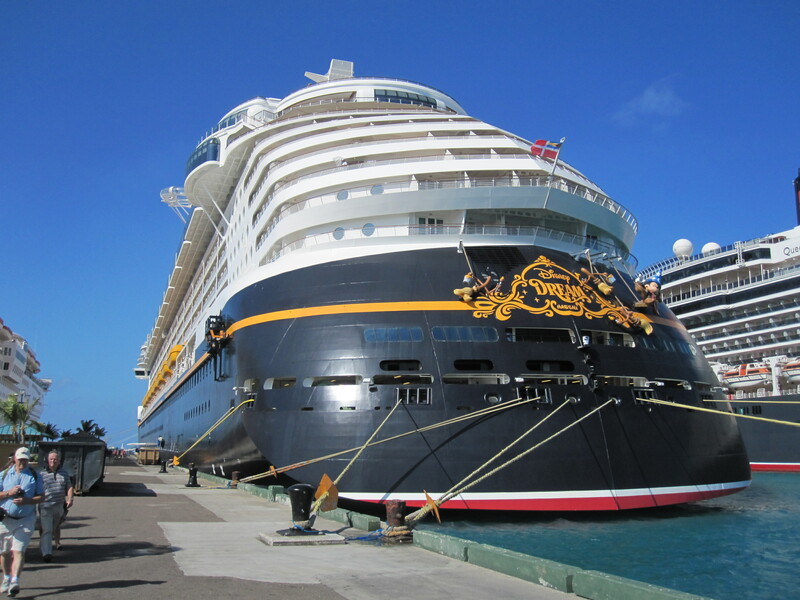 If you are not aware, we surprised the kids by taking them on a 4 day Caribbean Disney cruise aboard their brand new boat, the Disney Dream. 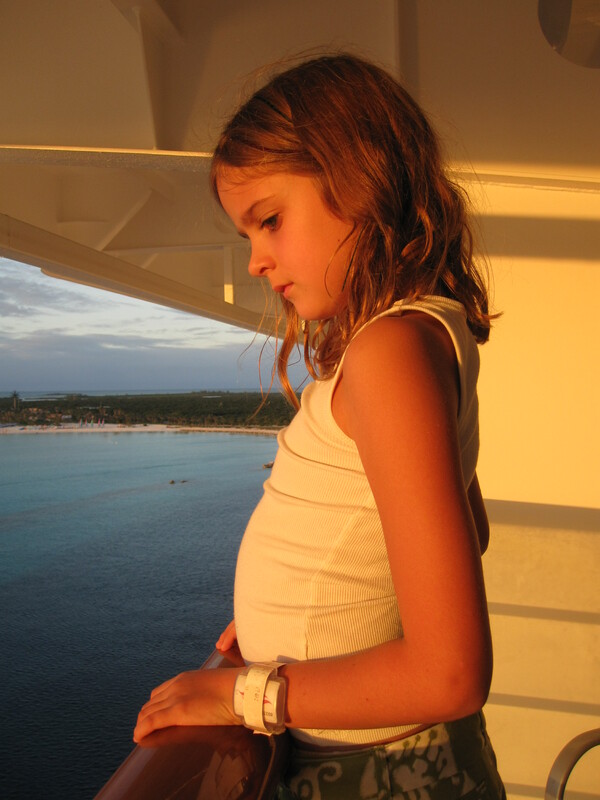 We had received one of those promotional sales DVD's in the mail at some point about the cruises, and the kids became obsessed with going on a cruise. Max especially so, I am pretty sure that he may know every detail about each boat in the Disney fleet after having watched that DVD probably 100 times. 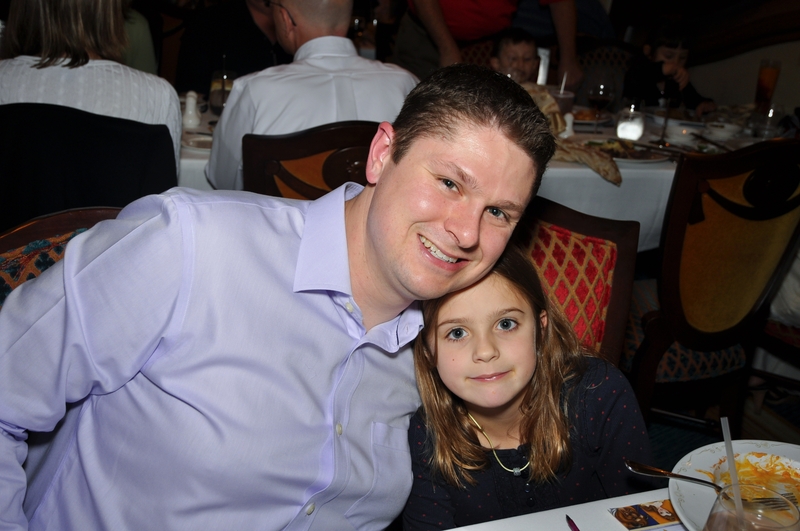 We'll get into a bunch of what we did on the boat, but I was a little apprehensive that Sarah may not enjoy a cruise. We are more of the lazy vacationer types, sleep in, decide what we are going to do each morning kind of people. I didn't know if the tons of scheduled activities and non-stop eating would float Sarah's boat (pun intended). Turns out that we all loved it and will definitely do it again. As a brand, I'm not sure that there is a brand that I trust more than Disney (and I'm not just saying that as a shareholder). 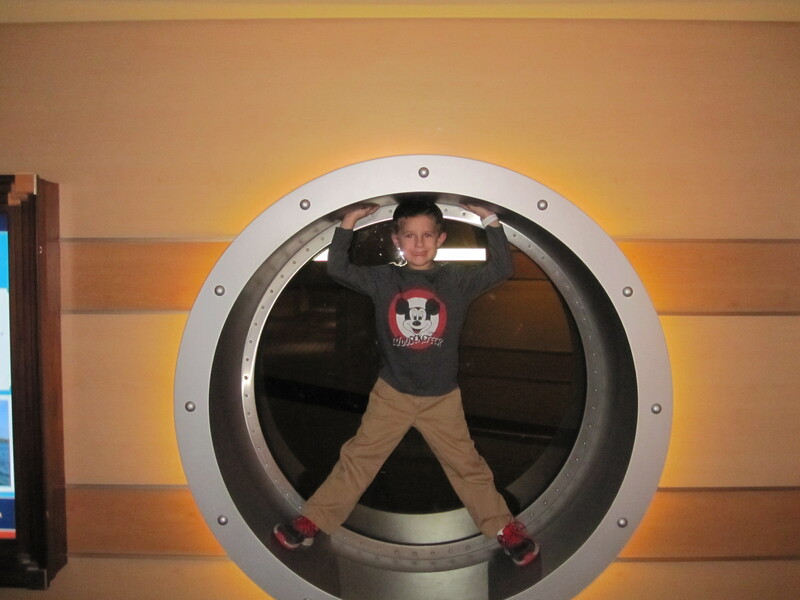 I know that doing something through Disney is going to end in an enjoyable time, and the cruise was no exception. Part of the excellent service of Disney is that they have a website open up to you once you have paid for the trip to be able to book excursions, make spa and restaurant reservations, and check out activities available on board. Then they also ship you a little book with a checklist on what to bring (don't forget the passports), and other tips that was really a pretty good little guide. Don't be surprised if you login online and find that a whole bunch of stuff is booked. The real serious cruisers get access before once in a while cruisers and book everything up. Not to fear though, try to pick and early boarding time when you check-in and then head straight for the front desk when you walk on and see what reservations are available. 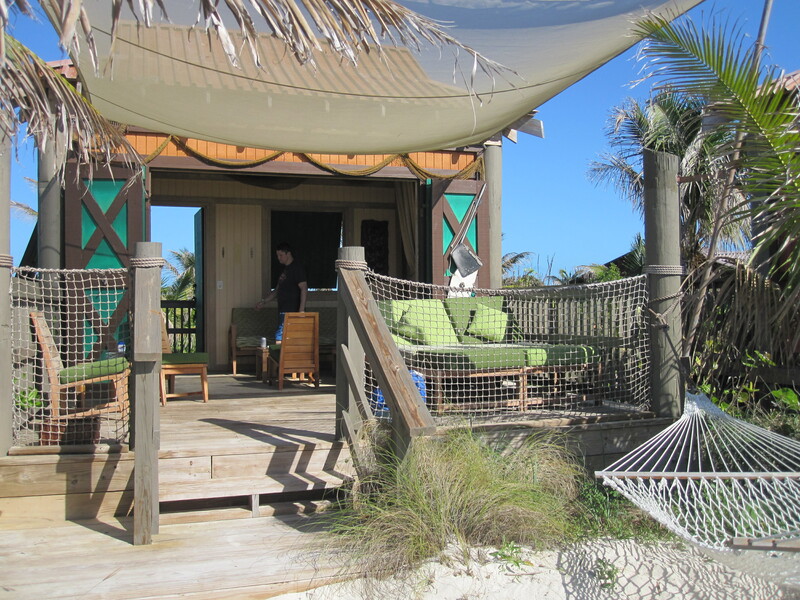 We wanted to get a cabana on Castaway Cay, and they were all taken online, but we got one without any problems once we boarded. 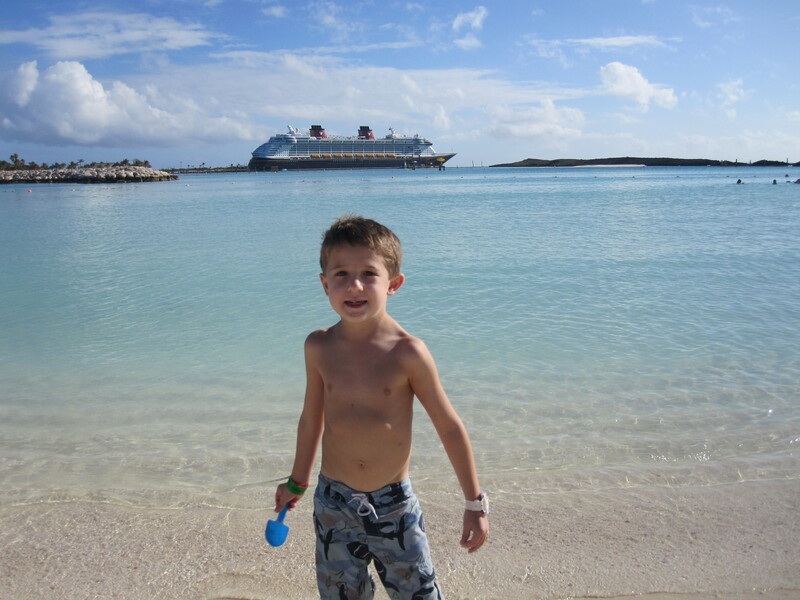 We took a 4 day Caribbean cruise aboard Disney's newest boat, the Disney Dream. I have only been on one other boat, so it is hard to compare, but it was one sweet vessel. 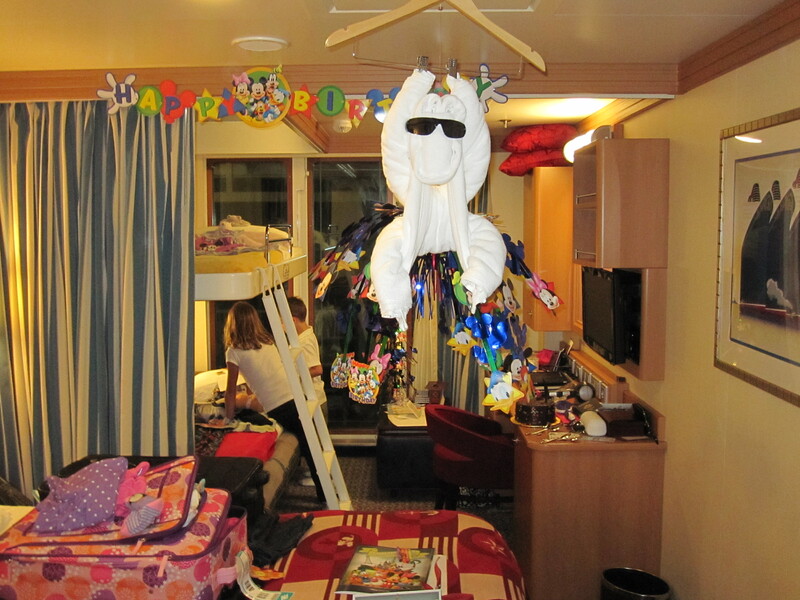 We had a category 4 room on one of the top floors with a small deck on our cabin. It had a split bath so getting ready was easy, along with a queen size bed (with lots of space underneath for suitcases). There was also a sleeper sofa, and then a bunk bed that was lowered from the ceiling each night while we were at dinner. 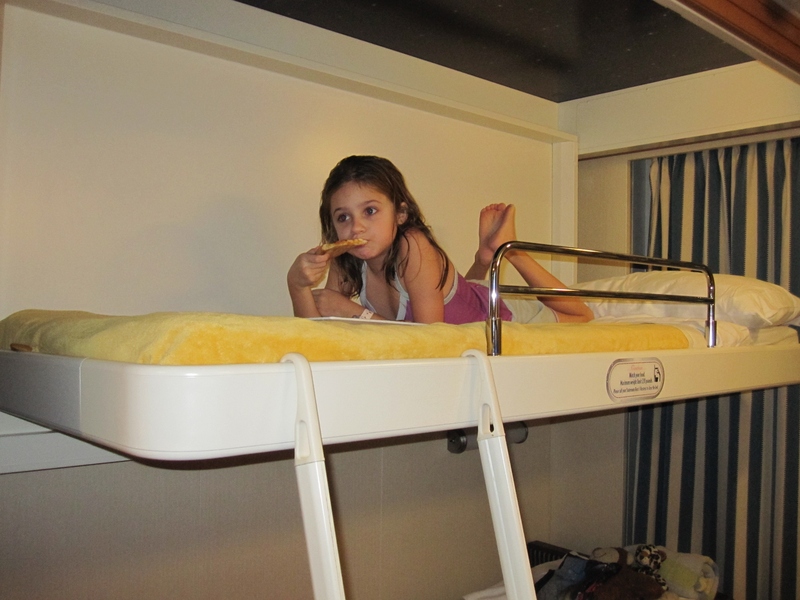 The kids thought the bunk beds were way awesome. 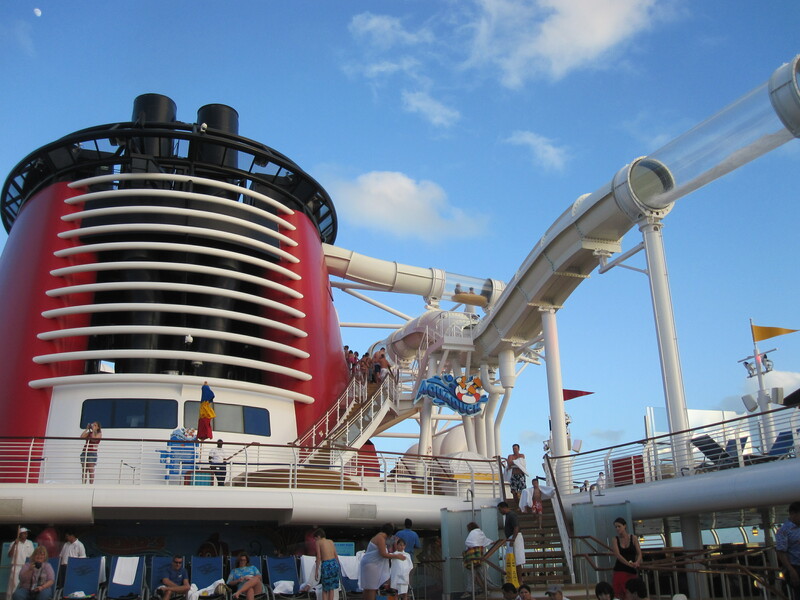 One of the signature features on the boat is the Aquaduck. The Aquaduck is a water"coaster" that extends over the edge of the boat, and then travels all the way around the top deck before finishing it. Two people can ride in a tube together. It was pretty cool, not super thrilling or anything, but still fun especially for the kids. Pro tip: ride it at night when there are no lines, otherwise expect to wait 20-30 minutes. We had the first dinner seating, so we would either go to the pool, or a show and then the pool after dinner, and it would be completely empty (could be because it was a little cold in early December, but it didn't bother us). 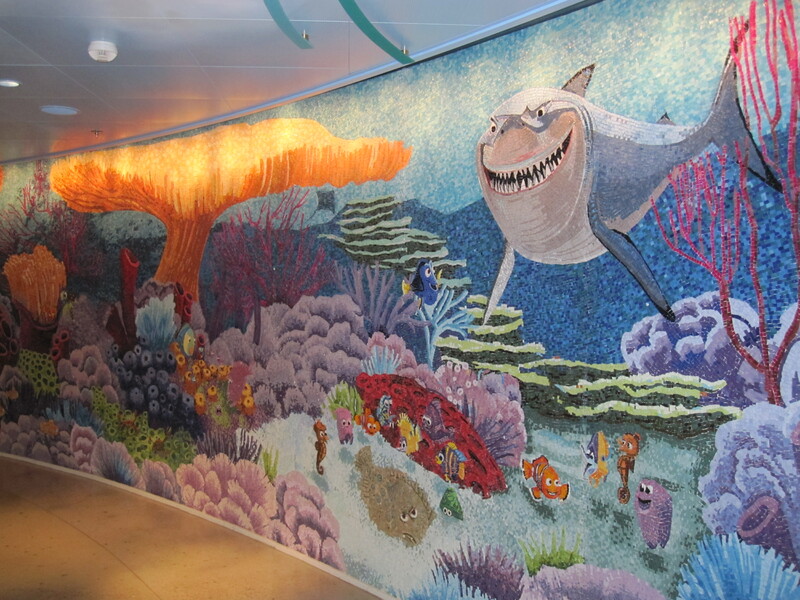 The ship really had a lot of awesome designs throughout, this amazing mural was one of the family favorites. This was one of the walls inside one of something like 8 restaurants. There were a bunch of excursions to choose from in Nassau depending on your wants. 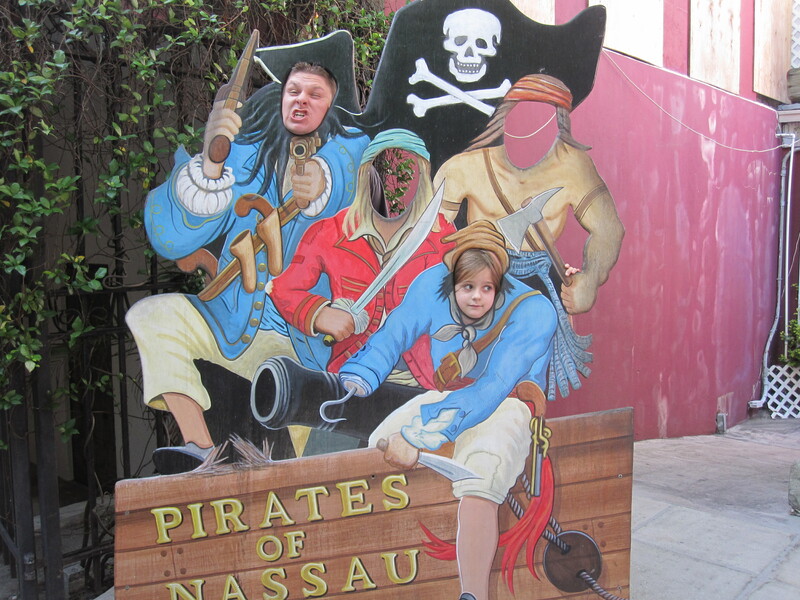 We decided not to do any in Nassau, because we just wanted to explore the town. Let me say this, I read all over the place about how shady and dangerous the area was around the port and Nassau in general. What a bunch of sissy Americans who must have written that stuff (I guess if having a local asking you if you want to take a tour of the island scares you, then you probably shouldn't leave the country). Seriously, I never felt threatened or scared the entire day walking around with Sarah and the kids, don't believe everything on the internet people. We spent the day walking around the city, checking things out. 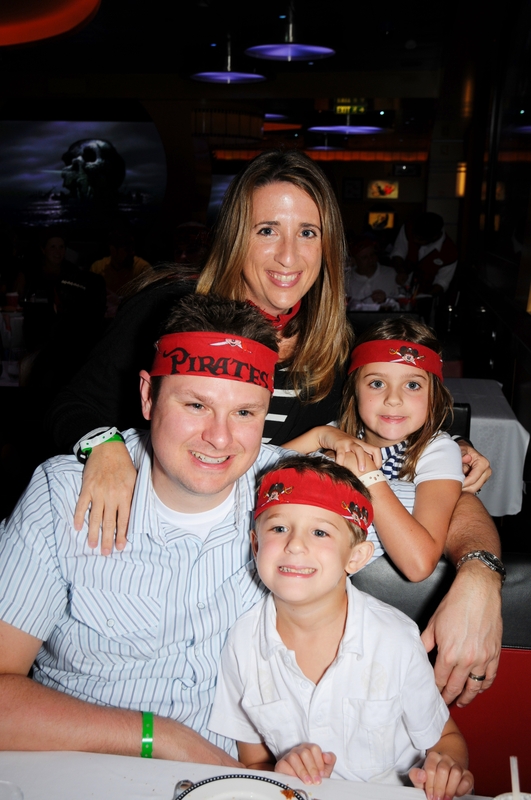 We did enjoy going to the Pirate Museum which had some pretty cool stuff, I would recommend that. In hindsight, I may have done the excursion to go over to Atlantis for the day. They have a pretty sweet waterpark and aquarium that I think would have been really enjoyable, but we still had a great time. We shopped a bit, had some ice cream, lunch at the Hard Rock Cafe, and the museum like I mentioned. The big shopping attraction in Nassau is jewelry, though to be honest the prices did not really seem to be any cheaper than here. You save on taxes which is nice, but I wouldn't get too excited about scoring cheap jewelry if I were you. 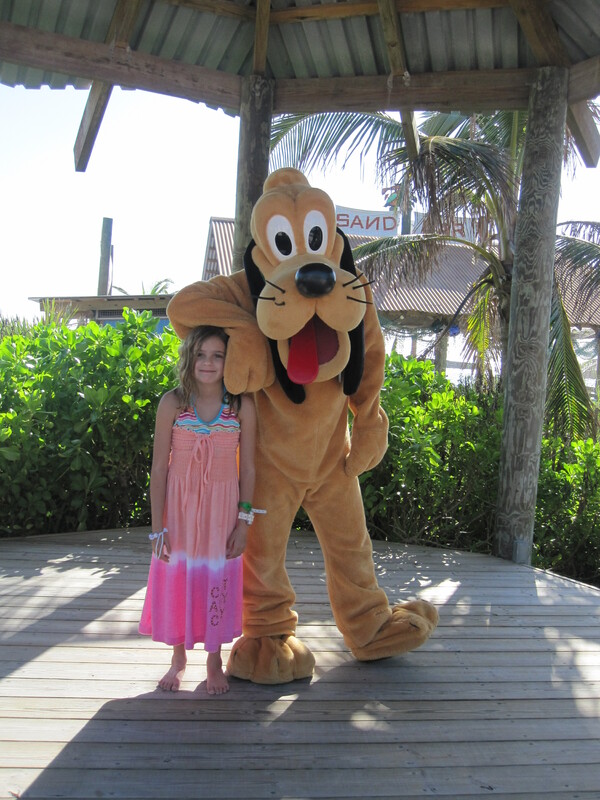 Castaway Cay is a small island in the Bahamas that Disney owns. The boat pulls right up at night so you wake up there. They have a few excursions and other activities on the island, along with the beach and swimming. We really splurged here and rented a private Cabana for the day. 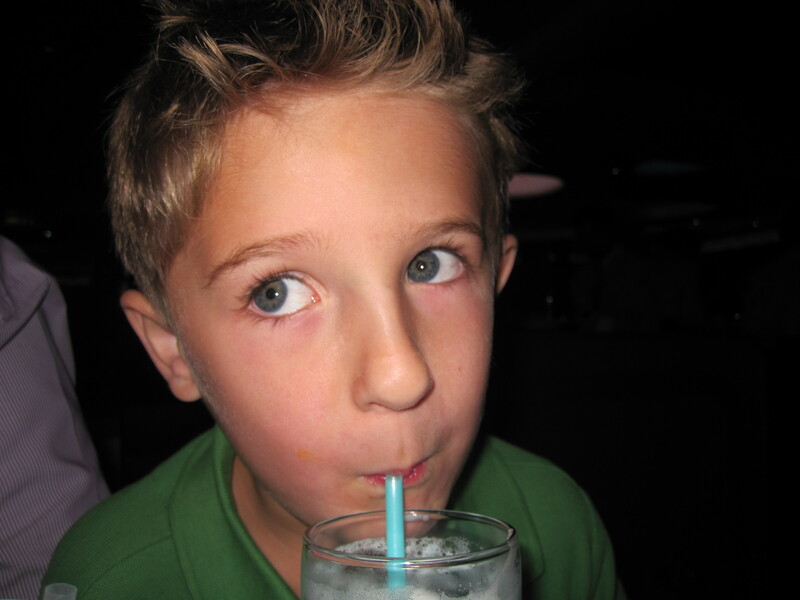 It was Max's birthday, and just sounded fun. If you can swing the dough, I definitely recommend it. You get your own cabana that is stocked with fruit, snacks, soda, water, suntan lotion, cold towels, towels, and a phone to your own server for anything else. You also get sand toys, snorkeling gear, tubes for the water, and bike rentals included. Plenty of stuff to keep you more than busy for the day. 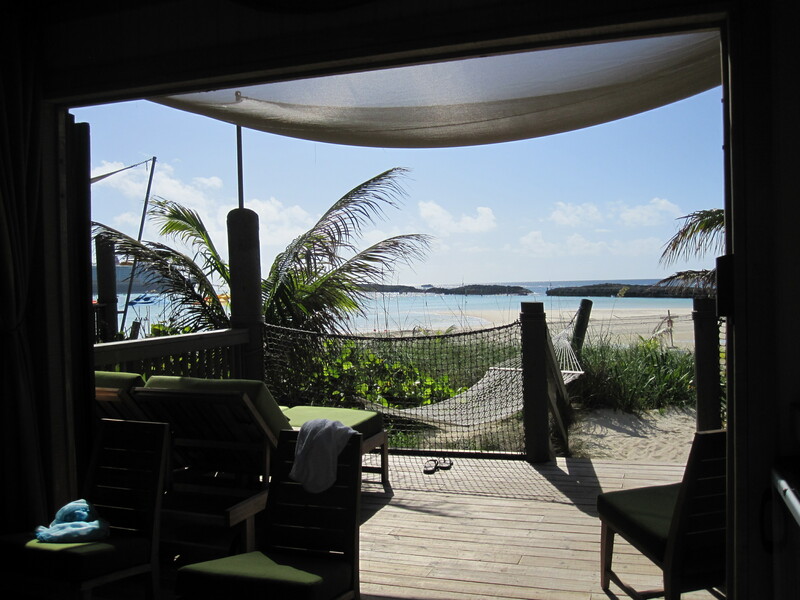 The cabanas are at the end of the family beach and even have their own private section on the beach. There is an adults only beach and I think those may have their own cabanas as well. Max played in the sand all day, while Sarah enjoyed the sun. Ella and I went snorkeling and spent some time on some pretty cool waterslides that they have built in the water. Ella was awesome snorkeling, she had never done it before, so I had to show her the ropes and then we headed out. I thought she would last 15 minutes and be done, we snorkeled for just over an hour. They have a whole area that is setup for snorkeling, where they adding some artificial reefs and a sunken boat and stuff to add some interesting things to look at. One of the key landmarks is a Mickey statue underwater. When we found it, I dove down to float next to it and look up at Ella, only to see her trying to follow me. 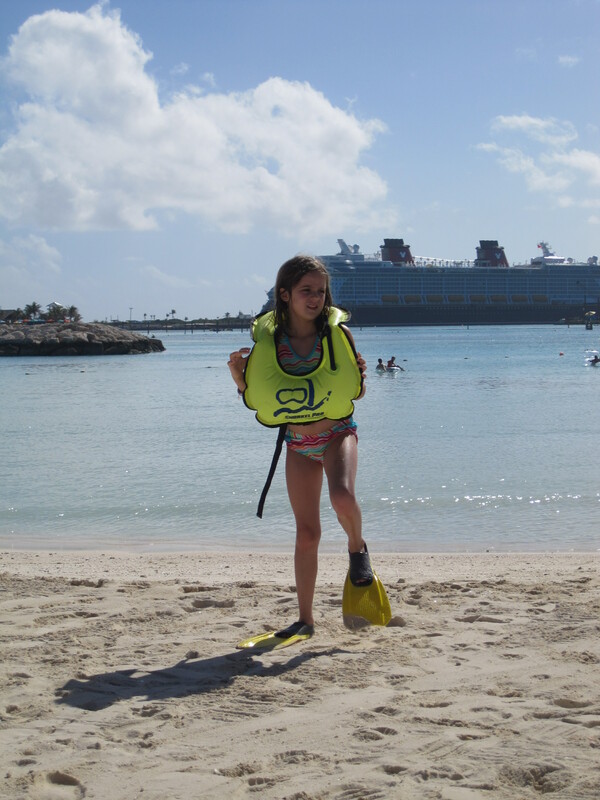 I had to surface and let the air out of her vest and then teach her how to dive with a snorkel. She did awesome, and swam all the way down to the Mickey statue as well. I wish I had one of those underwater cameras for that part. 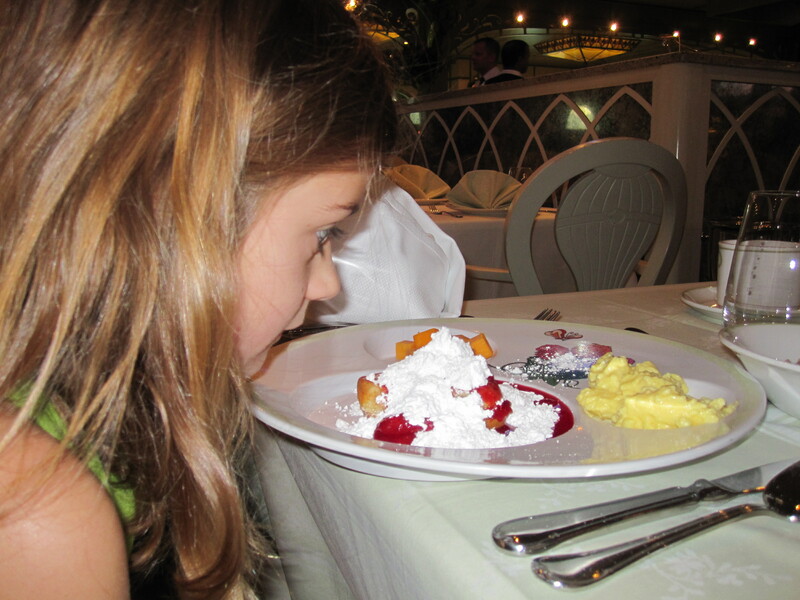 Disney of course has a restaurant on the island for lunch, along with ice cream and stuff which was a big hit. Sarah and Ella went on a little bike tour of the island just before getting back on the boat. My advice here is to actually wake up and get out to the island to enjoy it. By the time we had breakfast and got off the boat is was about 10am, and we had lost about 2 hours of island time. Get ready to eat, I mean seriously eat. There is food all the time, everywhere you go. 24 hour room service (a really nice menu too), a nice restaurant to have dinner at every night (full 3 course meal each night), and quick service (food, burgers, sandwiches, ice cream) by the pools. You eat and eat and eat. I was good and worked out the first morning (which was cool, the treadmill looked out a window as we were pulling into Nassau), but after that it was a no-go. We even had ice cream 5 times in one day for Max's birthday. It was fairly ridiculous. As most people expect, the restaurants are pretty awesome. There are three main restaurants on board, and then 2 "different" ones. There are 2 dinner services to be assigned to. If you have first dinner, then you can catch a show after dinner, or catch a show and then have dinner if you have second seating. 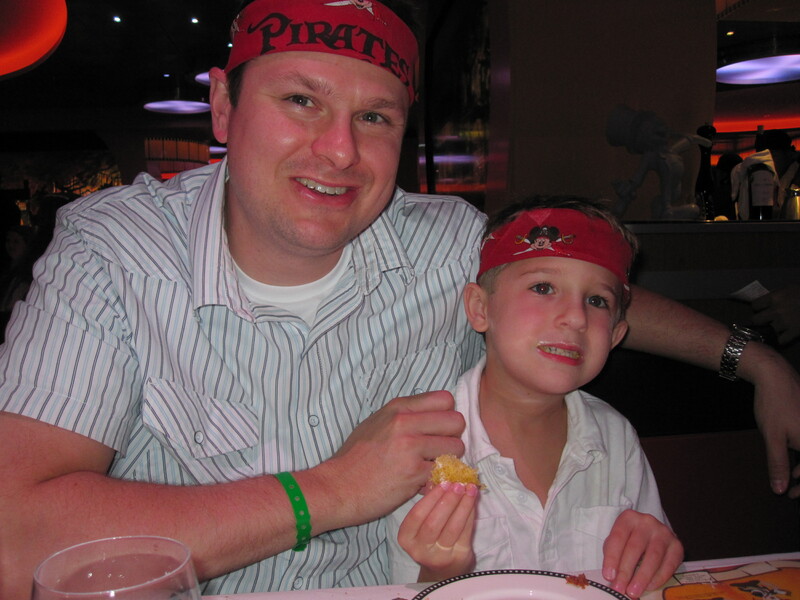 You end up eating at one of the restaurants twice because one night is pirate night (the third night of the cruise). 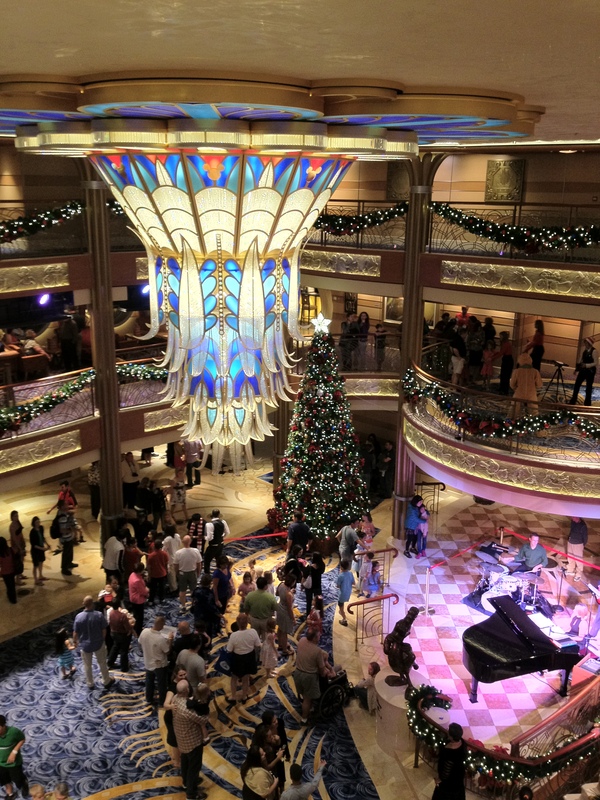 That night all of the restaurants have the same menu and then they cap the night off with a big pirate party on deck along with fireworks (they are the only cruise line allowed to set off fireworks at sea). Your waitstaff follows you around each night, which is great because they get to know you and know what you like. Each place has a slightly different theme and a menu to go with it. Every meal was really delicious, and the waitstaff made it even better. They did stuff like pour the ketchup for the kids (in the shape of a Mickey head), one night Ella ordered steak and our waitress cut her steak for her so Sarah and I didn't have to do it. There are two adult only restaurants, Palo and Remy, that cost extra if you want to dine there, and reservations are recommended 6 months in advance of your trip. There were reservations available when we boarded but we decided to not do it because we were able to reserve a cabana at Castaway Cay. From everything I have read, they are supposed to be quite amazing, I think we will definitely go on our next trip. One note on alcohol, make sure you remember that alcohol is not included and will be charged to your room. It is easy to grab the $10 fruity drinks from the waiters walking around the pool and stuff, just don't get too carried away. We ordered a wine package which I really recommend. We had a new bottle of wine each night with dinner for one price at the beginning. We never opened one of the bottles so they give that to you to take home on your last day. The cool thing about the wine package is that you can go to any bar and get a glass from the bottle that you already bought, along with taking a glass with you at the end of dinner to take with you. As with most cruises, there is a recommended dress code. For someone like me who does not wear dress clothes to work, and does not own any really, it is kind of a pain. I had to do a little shopping for the trip, and it makes packing a little more annoying with the extra clothes and shoes and stuff. 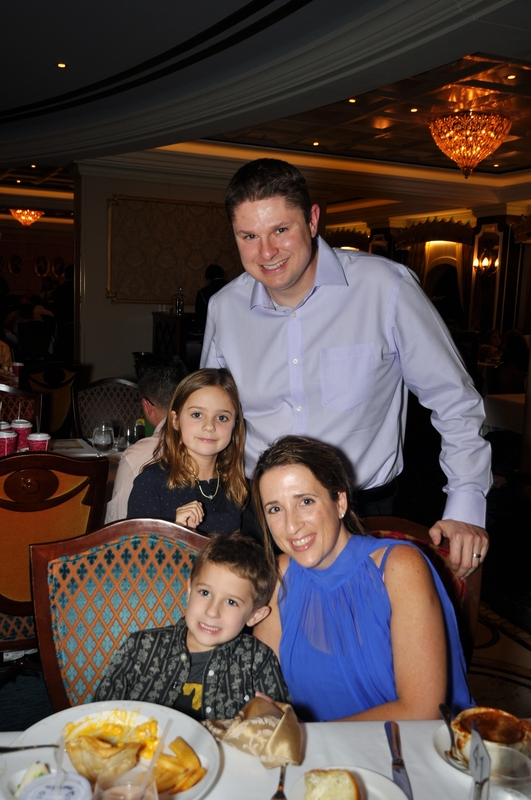 We would tell the kids that it was fancy night and that every one needed to dress fancy for dinner. Ella really got into it, Max tended to complain while we were getting dressed, but it worked out ok. I don't think that it was really enforced all that much, I think it was really more recommended. Palo and Remy may have required dress codes, I am not 100% sure as we did not go to those adults only restaurants. There are so many activities on board that they leave a schedule of the next day's events in your room each night while you are at dinner. Even over 4 days, we maybe checked out half of the activities at best, seems like there is something for everyone. Each day is anchored by a Broadway type show in a huge theater that is on the boat. We checked out two of these (Villains Tonight and Believe) and they were both really nice, the kids even enjoyed them. I hear the other two are worth seeing as well, but we chose the pool over shows on those nights. They also have a movie theater on board and showed the latest Pirates movie in 3D (it had yet to come out on DVD), and I am pretty sure they were showing the new Muppets movie that was still in theaters, but we didn't go to double check. We ended up not going to the theater, but it is there and looked pretty nice. There is also a family friendly "bar" (not really a bar, but sort of bar like without the booze and old drunk dude) where they do family games and trivia. We never made our way there either but it looked pretty cool. It seemed like there was always something going on at the pool deck. There are 2 pools and 4 (I think) hot tubs there, along with a DJ going, some kind of party, or movie being played pretty much all the time. They have a huge LED TV screen and play Disney movies while the kids are playing, along with a stage where they did a couple of shows when we set sail and then again on Pirate night (after a show there is fireworks, then a giant family friendly dance party). My favorite part there was we set sail on a Sunday, and the Lions just happened to be playing the Saints on Sunday Night Football that night. They played the live broadcast on the giant screen on deck which was pretty cool even though the Lions lost. There are also 3 kids clubs (1 is dedicated to non walkers) where you can drop your kids off and leave them while you go do something else. These were just great, they have a nice check-in and check-out setup and you can leave the kids and go do whatever you like while they do a whole bunch of organized activities in there. There is also some magical teens area where teenagers can hang out with other teenagers. That must be the most amazing place ever because Sarah and I don't ever remember seeing a teenager around the pool or anywhere else. Pretty sure the teenager area has its own pool and food and drinks, so it must be pretty sweet. I did manage to go to the gym one time while on board. It was a really nice gym, great equipment, and they even had several personal trainers running some group classes and walking around just talking to people, giving them tips. They do an organized 5k on Castaway Cay the morning that you dock there, but I was not up for that....maybe next time. There is a whole bunch of other stuff that we just never had a chance to check out like the spa, a whole sports area including putt-putt, an adults only section of several bars, each with its own theme. Even on a 7 day cruise I think you could try something new each day and just never get bored. Of course, being Disney, there are a bunch of character greetings and photo opportunities if your kids are really into that. 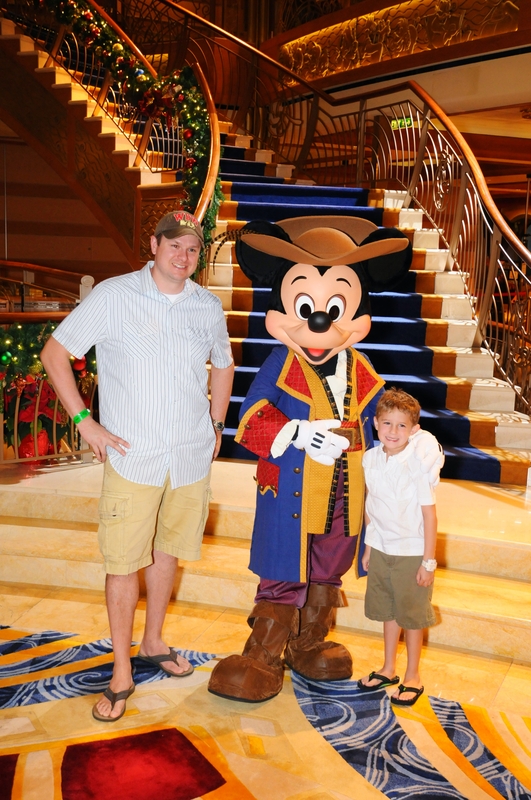 Our kids are so spoiled and have been to Disney so many times that they don't get too excited about that stuff any more, I think Max took a photo with Pirate Mickey and that was about it. Just a quick note on our experience with transportation to and from the boat. 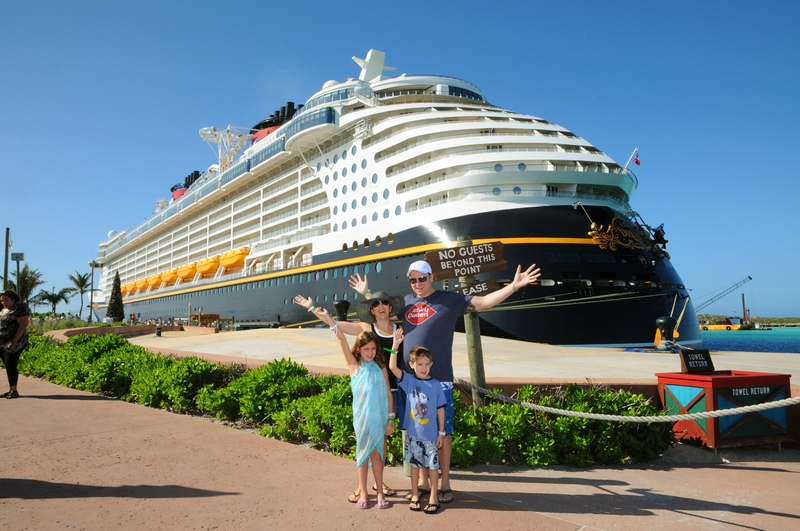 Disney offers shuttles directly from the airport to the boat, but getting to Florida from up here in Seattle is an all day affair, so we stayed one night at Disney and then headed to Port Canaveral. I rented a car (Avis had an office at a Hilton right across from Downtown Disney which was very easy to get to) to get us out there. It was cheaper then the Disney provided bus, but a little more inconvenient. If you use Disney transportation, they take care of your bags and everything, you just go to the bus, walk off and head onto the boat. But since we wanted to surprise the kids, we rented a car and said that we were going to spend the day at the beach. It was pretty cool to tell them that we tricked them as we came up over a bridge and could then see the boat. The other problem with renting a car is turning it in. I dropped Sarah and the kids, along with our bags, off at the curb and then took off to turn the car in which was about five miles away. Not being very familiar with that area, I managed to get pulled over for speeding. The officer was very cool when he found out I was on vacation about to go on a cruise, he let me off with a warning and directions to the Avis office. Avis did have a shuttle to get me back to the cruise terminal, but I barely made it in time for our boarding call. To get back to Disney after the cruise was over we used the Disney bus which was a nice convenience. Next time we will just use the Disney transportation each way. Just a last note that if you go on the cruise, keep an eye out for those deck chairs. I broke my toe accidentally kicking one thinking that I was walking by it. Gross photo below of the toe in question. I call it the stupid toe because I have literally broken it 4 times since Ella was born seven years ago. I think the most complimentary thing that I could say is that we will definitely do it again, probably in 2013. Our only regret is that we didn't book the next cruise while we were on board. If you book another cruise, you save 10% which is nice. At the time, we decided that we may as well wait since it would probably be two years before we did it again, but now we regret not taking advantage of the good price and doing it then. Last tip, use a travel agent to book. I couldn't get a better price than booking direct, but we were able to get a room credit from our agent which was great. I can also give you a great referral on an agent if you are interested, just let me know. Sounds like you guys had an amazing time! I really want to go, sounds like sooo much fun.